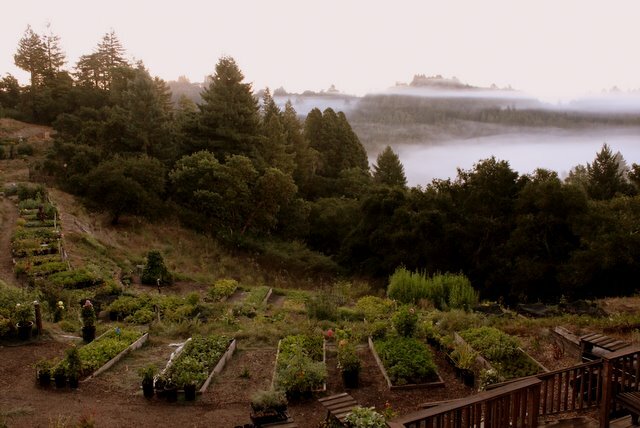 It all started at Love Apple Farms, a biodynamic farm and kitchen garden that sits in the mountains of Santa Cruz with terraces overlooking the Monterey Bay. Love Apple maintains an exclusive relationship with the two-Michelin-star restaurant Manresa, where renowned Chef David Kinch creates seasonal menus with the produce harvested each week. From Thursday farm dinners to cooking classes taught by Chef Kinch to the apprentices’ cottage kitchen, Love Apple Farms is where farming and eating well go hand in hand. It’s also where Girl Farm Kitchen was born, and it continues to serve as an inspiration as I cook and grow my own produce today. Have you been to Treebones on the PCH, Big Sur way? They have a small organic farm and the produce is used in their restaurant. A strong ditto to what Jerome, Melissa and John said about your LA Times column which I read in the Minneapolis paper. I would love to see more of your writing about life, though of course “the food stuff” is great also. Having that much gratitude for your parents (and enjoyment of them) so soon after the dreaded teen years is great; I think it took me a lot longer to realize what treasures I had there. This comment is in reply to your blog about living with your parents after college. I don’t know what you studied in college, but you don’t need it. Keep writing. There are many bloggers of their lives. Your mastery of language and prose makes yours worth reading. Call yourself perhaps a Cultural Entrepreneur. You can improve the culture (doing good) and do well. If your blogging reveals 1/10th of your living, you parents are blessed many times over to have you in their home. I enjoyed your piece in the Star Tribune (Minneapolis) today. My son’s in college, and I plan to share it with him. I think there’s some “shame” associated with leaning on or needing your parents. I think he’s coming around to realize it’s not such a bad thing to have that support, and that’s it’s good to acknowledge and appreciate it. Nice job; keep on writing. Bless you! I loved your Op-Ed piece in today’s Minneapolis Star Tribune about living at home. It wasn’t just the parts about how you enjoyed it that pleased me. It was instead your comment that your family structure was being enhanced by your presence. This is so true. We enjoyed our son at home for just a short year after he graduated. He too helped out with heavy chores, such as chopping wood and yard work. But, for me, he helped most in providing a stronger sense of family than I had shared in many years. He eventually went on for a MA, and subsequent jobs and marriage. He and his wife have given us wonderful grandchildren. But what wonderful memories he left behind as a fine, well educated young man for us to treasure. Keep writing (you do well), follow your mind and your heart, and the world will find you. In the meantime, share your youth and your thoughts with your parents so that your memories will be rich and strong when you move on, and they pass on. Love it! Biodynamics is such an interesting aspect that is just one of many bridges of food and wine. Glad to find your blog via Cimarone wines. Looks like a wonderful place to work, learn and share !